It's that time of year again... graduations are just around the corner! 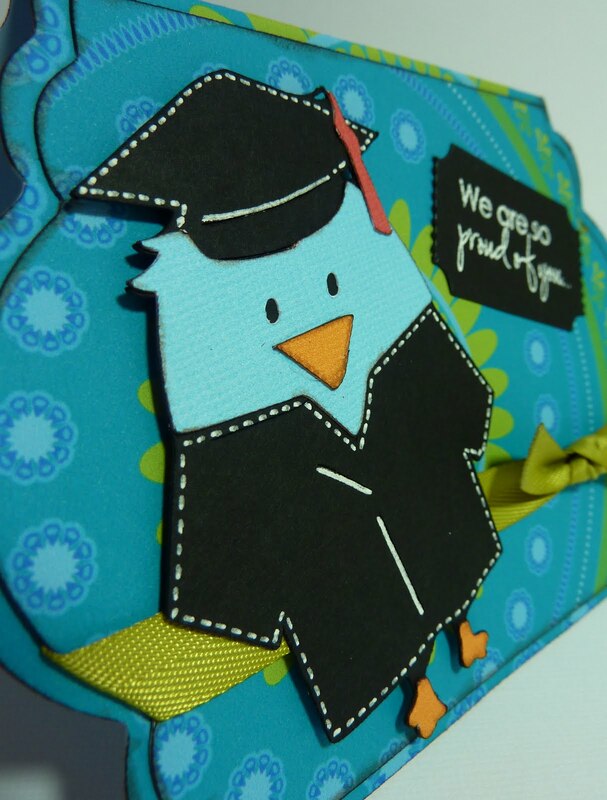 Did you know that we are having a graduation challenge over at Creative Critterz Imaginations? Join the fun here, and you could win the Snapshot: Everyday Imagine cartridge! I made this card using the 3 Birds on Parade cartridge and the All Wrapped Up Imagine cartridge. My card base is from All Wrapped Up. I print and cut it at 5.5" on light blue paper so that the inside of my card wouldn't be white. I then separated the same card into layers, and sized them at 5.2". I deleted all of them except for the one I adhered to the front of my card. I did this so that I could have a layer to tuck my ribbon under. My bird, from 3 Birds on Parade, is cut at 3.5". I used the "cut only" feature for the base, and cut it on some nice heavy Papertrey Ink black cardstock that would work well being popped up. The rest of the layers are flood filled with colors from All Wrapped Up. My "ticket" was punched from black cardstock with a Papertrey Ink die, and I then heat embossed a sentiment from My Creative Time's "Follow Your Dreams" stamp set. I used this same stamp set for my sentiment on the inside of the card. Katie great card love your colors and the stitching. 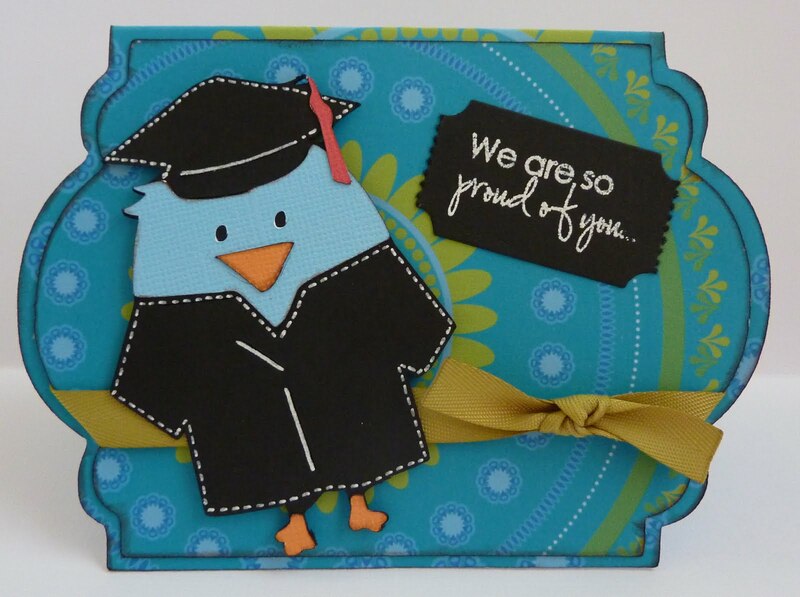 Hi Katie, really cute graduation card. Oh what a darling little card! I love that birdie! Wonderful Wonderful work! Love this card!! I'm so glad I have this cartridge. That is so cute! I love the colors. Hee!! I love this little guy in his cap and gown. What a cute card, Katie!! What a cute card! I have that cart & didn't realize there was a graduate there. Thanks for the idea, I have a neice graduating HS & a nephew graduating college. Very very cute. I just got that cartridge (in the Michaels rebate promo). Can't wait to play with it now after seeing your cute card. Circle Weekly Challenge: Sketch Challenge! Thank You Emma - Surprise Birthday Hop!